Located at 3,220 feet above sea level atop Whetstone Ridge, one of the highest ridges along the Blue Ridge. 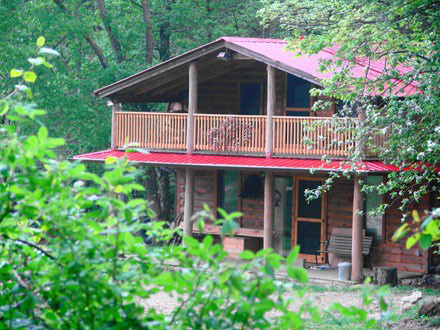 Rock-n-Creek Cabin offers a well appointed fully equipped two story cabin with all the amenities and comforts of home. This quaint cabin sits amidst the mountain backdrop overlooking four private ponds and a natural trout stream, the Tye River. Relax on any one of the three covered porches and large open deck overlooking the fields of wildflowers. Enjoy cold weather comfort in front of a crackling wood burning stone fireplace. Rock-n-Creek Cabin offers three bedrooms, two loft rooms and a double sleeper sofa next to the fireplace. Also on site visit the award winning decoy studio of Buck Island Bay Decoys. See hand crafted decoys made during your stay. Rock-n-Creek Cabin is located off route 56 and route 686, 2 miles east of the Blue Ridge Parkway (MP 27).